This article was first published on January 8, 2019 on KVCR. Some residents of Bloomington say they’re devastated after the San Bernardino County Board of Supervisors ignored their concerns about health and safety, and used a “greatly flawed” developer’s impact report to approve a warehouse in a residential area near a high school. KVCR’s Benjamin Purper has more in this feature report. I’m at the house of Thomas and Kim Rocha. They live in a cul-de-sac next to 17 acres of empty land in the unincorporated area of Bloomington. In September, the San Bernardino County Board of Supervisors voted to re-zone that lot from residential to commercial to allow for the construction of a 344,000 square foot warehouse. “It’s supposedly 60 feet from my wall, from my back wall,” says Kim Rocha. I asked her how she felt about a warehouse going up so close to her house. That warehouse, she says, will greatly impact her quality of life. It will bring noise, traffic, lighting, and air quality risks from all those idling trucks. And there’s also safety concerns with all the big trucks going through that area. The proposed warehouse will be less than 1,000 feet from Bloomington High School. Josie Gonzales, the San Bernardino County Supervisor for this district, declined an interview with KVCR. But proponents of the warehouse argue that it’ll bring jobs and economic growth to this area. But Ericka Flores with the Center for Community Action and Environmental Justice says that growth shouldn’t come at the cost of residents’ health. And besides, Flores says, the jobs that will come to the community aren’t necessarily good ones. She points out that these warehouses often hire through agencies that don’t provide benefits to their employees. Eric Nilsson is a professor of economics at Cal State San Bernardino. He examined the economic impact report that the developer presented to San Bernardino County, and said it’s full of errors. The report says the warehouse will create about 290 jobs. But Nilsson says the methodology used to reach that number is flawed. Also, Nilsson says, the jobs the warehouse will bring might not be good jobs. Again, Supervisor Josie Gonzales declined several attempts by KVCR to get her response to the purported flaws in the economic impact report. 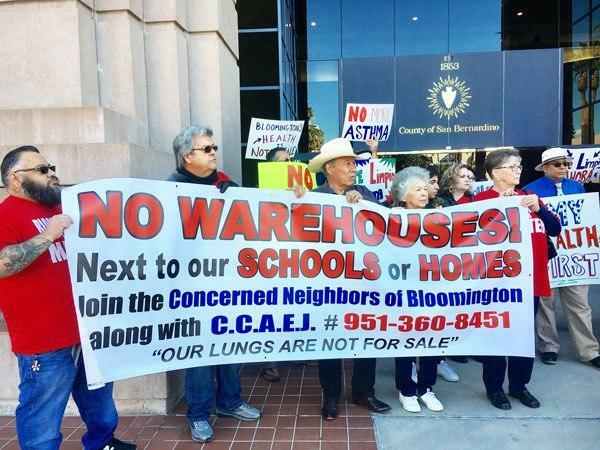 Nevertheless, Gonzales and three other supervisors used the report’s conclusions to vote to rezone the residential land to accommodate the massive warehouse. Former Supervisor James Ramos was the lone dissenter.